If you are a hunter, it is likely that you are salivating over than headline. Put away the ammo, just for now though, since I am talking about hitting that buck (or doe) with your vehicle. 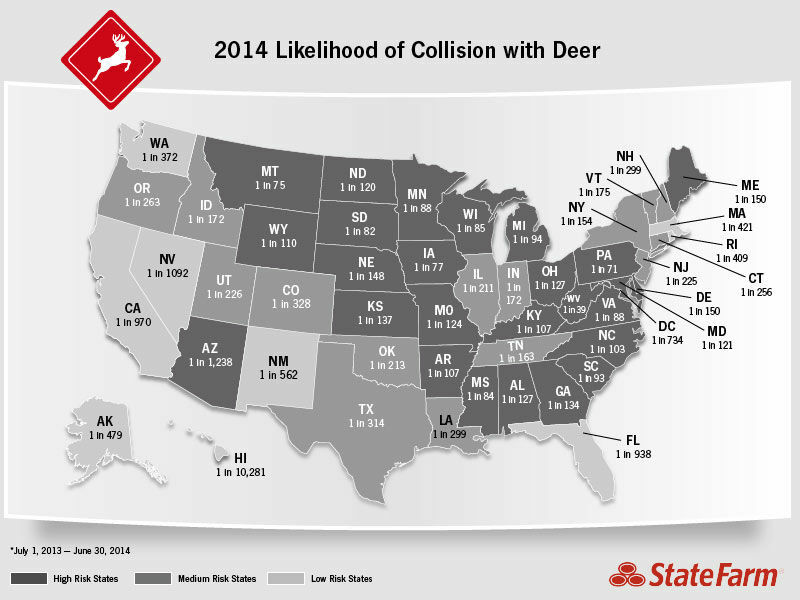 It’s no surprise that the national average cost per claim is up about 14% to $3,888, but it’s important to remember that collisions can occur with frequency in urban areas as well as rural ones since the region west of San Antonio and Austin have the highest deer density in the state, according to Alan Cain, Texas Parks and Department White-tailed Deer Program Leader. For the eighth year in a row, West Virginia tops the list for likely collisions with odds of 1 in 39 that you can expect some vehicle damage. Texas odds are 1 in 314 with the national average of 1 in 169. No surprise: Hawaii is at the bottom of the list for the eighth year in a row with 1 in 10,281 odds, meaning that you are more likely to win something on a scratch-off lottery ticket than to even see a deer. Use extra caution in known deer zones and remind people you know (who may not be as knowledgeable) that deer are everywhere, are unpredictable, generally move in groups and are most prevalent at dawn and dusk.